When Fedor Emelianenko was handed his first professional loss in nearly a decade, the conspiracy theorists immediately come out of the woodwork crying foul. Surely, the only way the planet’s baddest heavyweight could lose to Fabricio Werdum was by taking a dive, right? “As far as the rumors about my last fight being set up … I was asked about it many times already. 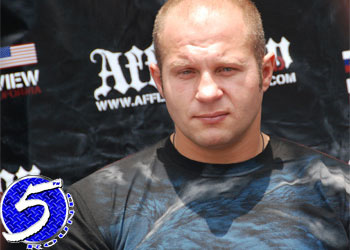 I will never go against my conscience and never betray my country like that,” Fedor told Gazeta.ru (via Bloody Elbow). “Money doesn’t matter that much to me that I could lie to people. The thought of Fedor intentionally tanking a fight and tainting his legacy for some extra cheddar is completely asinine. It was apparent in how he was forced to cry uncle – with ONE reluctant tap on the thigh to embarrassingly admit defeat. Although his unprecedented run wasn’t stopped by a vicious knockout like prior legends were subjected to, the Russian was “caught” nonetheless. Despite succumbing to Werdum’s lanky limbs, Emelianenko wasn’t in any rush to give the art of BJJ any props. It has been reported that Team Emelianenko is currently in negotiations with Strikeforce in regards to their meal ticket’s return to action. Obviously, an extension to retain the impending free agent’s services is the primary topic of discussion.